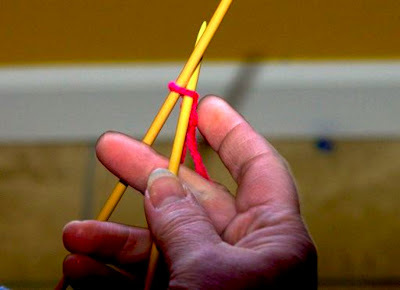 For folk who want to learn to knit with one hand. We left off with the slip knot on the holding needle which is the one in the towel. 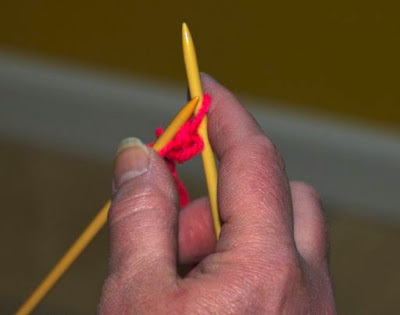 Pick up the working needle which has no stitches on it, and slide the tip up the holding needle from below the single stitch, through the loop, so that the working needle moves under and behind the holding needle. Tuck the working needle in to the belt to keep it in one place. Now that your hand is free take the long tail and move it away from your body, past the two needles, then up and between the two needles, then down and back towards you. You have made a loop or part of a loop over the working needle, the needle tucked in the belt. In the following picture my finger is near the short tail of yarn and my thumb is near the long tail of yarn. You can see it could be easy to pick up the wrong tail. You always want the long tail that comes from the skein of yarn. Also if you look carefully you can see a section of yarn is now between the two needles. This section of yarn goes behind the to needle and over the second needle. 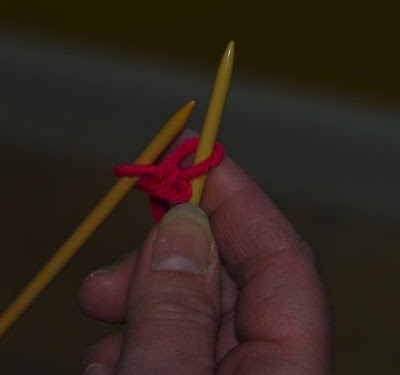 Remember you can tuck the button end of a knitting needle under the belt when ever you want to get a different and better grip on your needle. I find for me that I hold the long tail and working needle with my ring and little finger. Then my thumb and other two fingers are able to control the stitches. Usually I have my first finger on the loop/stitch I'm working with and extend my index or second finger to stop the stitches on the holding needle from slipping off. My thumb helps my ring and little finger guide the working needle. Remember I have been knitting for the better part of 40 years and I have full fine motor skills of my right hand. What works for me is an idea for you to use to find what works best for you. Controlling the tension of the long tail will help you control the stitches on the working needle as the long tail is always attached to the first stitch of the working needle, which is the stitch closest to the tip. 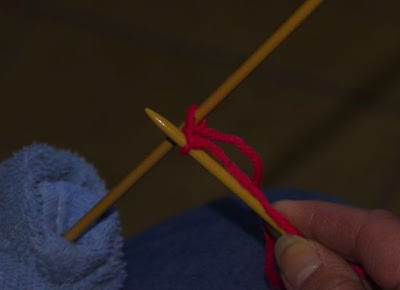 Use your hand to move the stitches on the needles down both needles till you are feel sure they will not slip off. 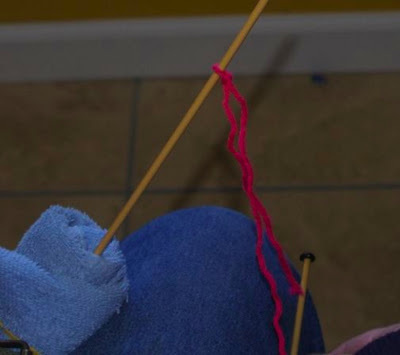 Take a hold of the long tail of yarn and the working needle, the needle that is stuck under your belt, and slip the working needle free from the belt, being careful not to let stitches slip off. Keep the working needle behind the one in the towel, the holding needle. You now have a bit more free movement of the working needle even though it is held near the other needle by a loop of yarn. Slide the tip of the working needle, down the needle in the towel, Until the tip of the working needle, the one in your hand, is about two inches above the loop that is around both needles. Hold the long tail and the working needle, with your ring and little finger. 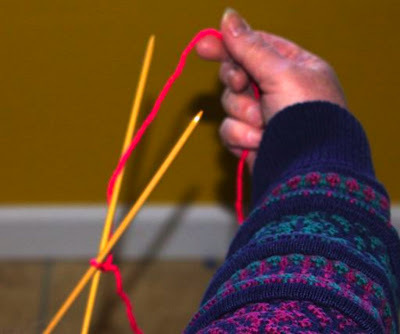 Keep the long tail tight to help keep the loops from slipping off the needles. Slide the tip of the working needle, down the needle in the towel, Until the tip of the working needle, the one in your hand, is about two inches above the loop that is around both needles. 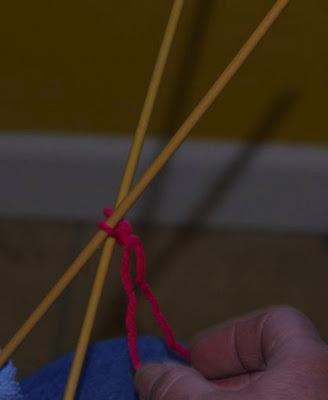 In the next picture you will see that the yarn you placed between the two needles, now divides the loop around both needles, the older loop. This yarn is held tight by my hand of which you see just my finger. This is what will become the next new loop and stitch. We will now use the needle my finger is on to catch this piece of yarn and pull it through the older loop. This new loop we want to put on to the holding needle. Pull on the working needle to loosen the new stitch. Loosen the stitches when you are at least half way down the needles or they may get away from you and slip off the tip. The place your index finger on this new stitch, and slide both up towards the tips of the needles. Remember, controlling the knitting needles is like controlling a pencil, if you keep your hand at the eraser end of the pencil, for every small movement you make at the eraser end, the tip will make huge movements. So the shorter you make your needle by holding it closer to the tip the more control you will have over its movements. Still holding the long tail and the working needle with your ring and little finger, place the first joint of your index finger on the new stitch and your thumb on the old stitch. 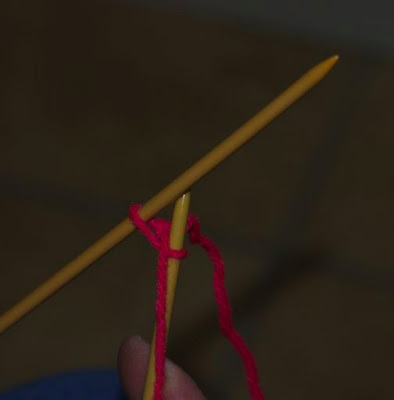 Move the new loop over the holding needle's tip and then down the holding needle to a point where you feel the stitches will not slip off the points. Let go of the long tail and pull the working needle down and out of any stitch. The holding needle, tucked in the towel, has two stitches. The working needle is free of yarn. 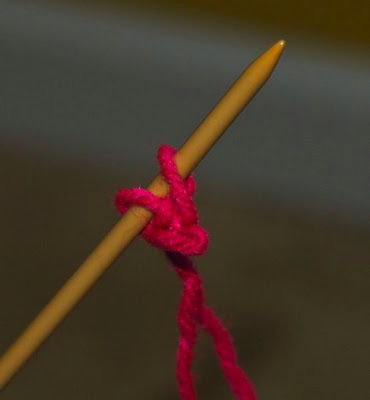 From now on you will be working with the loop/stitch closest to the tip of a knitting needle. Go to Third Stitch cast on, One hand knitting. I am a mom with a geology degree. Note the mom comes before the geology degree. When child number one was starting to think college thoughts we looked into and started to volunteer at the local Natural History Museum. This led to me developing and presenting activities for the parent child team which I now present at the local library.